Keanu Reeves was reportedly very close to joining the cast of Captain Marvel as Yon-Rogg. 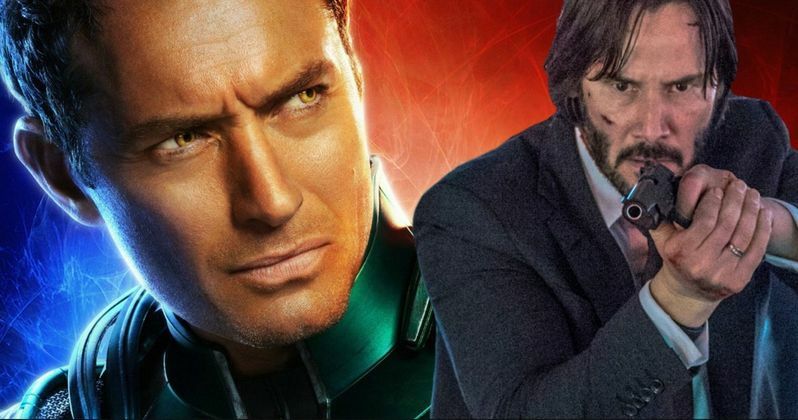 The part obviously went to Jude Law, but it appears that Reeves almost signed on.Keanu fans have been wanting to see him in the Marvel Cinematic Universe for years now and have been expressing their desires on social media. And why not? The actor would make for a great addition to the MCU in just about any capacity. However, the actor has his own John Wick franchise, which fans are just as excited about. While fans want to see Keanu Reeves in the MCU, that can still happen at some point down the line. MCU Phase 4 will begin with Spider-Man: Far From Home, so there's going to be a lot of new characters that will need to be cast. With that being said, seeing Reeves in Captain Marvel would have been pretty badass. Charles Murphy says that it was almost a reality. He explains. "If not for John Wick 3, he'd have been Yon-Rogg. He was set to take the role and then, when he had to drop out, they moved SUPER QUICK on Jude Law." Jude Law was a great choice to take on the role of Yon-Rogg, though his character has not been officially confirmed at this time. Law and Brie Larson have an excellent chemistry, which is clearly visible in the trailers that we have seen for Captain Marvel. The movie is now less than a month from hitting theaters, so we'll have a much better idea about Law's performance and whether or not Keanu Reeves could have done a better job soon. As for Keanu Reeves, the first trailer for John Wick 3 was recently released and Wick fans were pleasantly surprised with what they saw. Director Chad Stahelski promised that the third installment will be much bigger and bloodier than the previous installments, and he was not kidding. The trailers show that the director delivered on his promise. Both Stahelski and Reeves have ideas to keep the franchise moving forward, so it might be hard to nail the actor down for a future in the MCU if the John Wick franchise keeps building on its success. Captain Marvel hits theaters on March 8th, while John Wick 3 debuts on May 17th, a few weeks after Avengers: Endgame lands. It's going to be a crazy year for Brie Larson, who stars in both of the next MCU projects and Keanu Reeves, who is reportedly getting ready to jump into the long-awaited Bill & Ted 3. Reeves and Alex Winter have stated that production on the sequel is supposed to start early this year, which would mean that it has to happen soon, especially is they are going to make that holiday 2019 release window that has been hinted at. The Keanu Reeves and Captain Marvel news was originally reported by That Hashtag Show's Charles Murphy.